It's possible you might be getting just a bit tired of 1961, since we've spent most of March there. To tell the truth, regardless of my affinity for the year I'm getting a bit tired of it as well. However, you deal with what you have, and for some reason March was never one of the big months in my collection. Therefore, we're back to '61 one more time! Unfortunately, in many respects this week's issue looks a lot like last week's. NBC telecasts the NIT championship from Madison Square Garden on Saturday afternoon (Providence defeats Saint Louis 62-59), Channel 11 covers the championship of the Minnesota State High School basketball tournament Saturday night, and on Palm Sunday evening Hallmark Hall of Fame presents James Daly in "Give Us Barabbas." Armstrong Circle Theatre is on both weeks, and Paul Hartman, subject of a feature story last week, is a featured player this week in NBC's Bell Telephone Hour on Friday night. Don't despair, though - there are certainly enough differences for us to be able to squeeze something interesting out of this week. For example, Gary Cooper. Coop is, in the words of TV Guide, "what few actors become in their own lifetimes - a living legend." 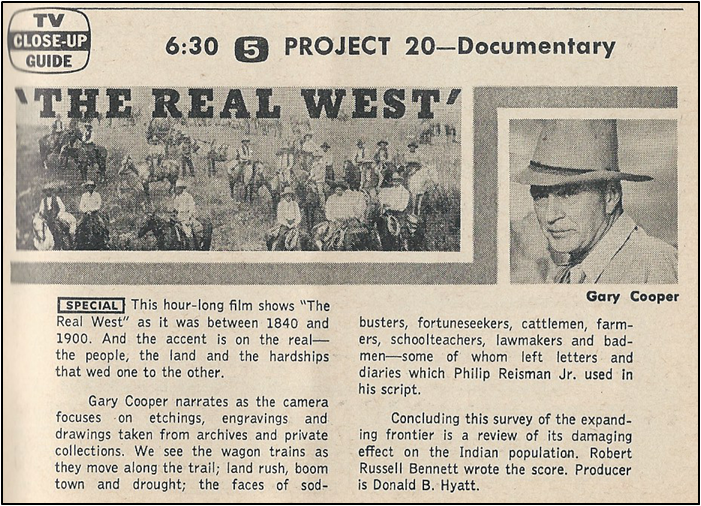 He's profiled in TV Guide this week because of his appearance on NBC's Project 20 documentary series on Wednesday night, as host and narrator of "The Real West," Project 20 uses a "still-picture style" familiar to us today in the works of documentarians like Ken Burns. Although Cooper figures only 25 or 30 out of the more than 100 movies he's done have been Westerns, he knows that "people still seem to think of me as a Western actor," and for good reason: movies like High Noon (for which he won the second of his two Oscars) have made good use of his laconic, dignified style. He has a love for the West, and Westerns, and looks with some bemusement at the state of the Western on television. "I would say that the majority - not all, but the majority - of Western shows on TV are sort of laughable. They get to wearing not one but two six-shooters and some of them even strap some kind of trick gun to their leg and these people would be laughed right out of any authentic western town say between 1850 and 1880 or 1890." That's one reason why he's accepted the Project 20 assignment, "It's authentic. It deals only in still pictures and it tells the story of the West as it really was," because, "if those people shot themselves up as much as they do on some of these TV shows they never would have got the West populated." Cooper makes quite an impression in this unbylined piece, his engaging manner belying his stolid reputation. He's "easily at home in a $250 Savile Row suit as in a $2.50 pair of blue jeans, and can, with exactly the same natural aplomb, order cracked crab and white wine on the French Riviera or a hamburger and a cup of coffee at a Montana roadhouse." He exhibits an easy, friendly style; when asked about his reputation, he explains how he came by his strong, silent persona: "I learned very early in my career that nothing you ever say gets quoted verbatim by the press. So for many years I just clammed up and didn't say anything. I guess now I've reached the age where I don't particularly care. Anyway, I talk." This is a rare TV appearance for Cooper, the first "role" he's ever played aside from playing himself on variety shows and awards presentations. He's not sure about the medium: "What I object to about television is not the shows so much as that box you've got to watch them on. It's small and it's the best there is. It seems to me manufacturers could make much better TV sets than they do." As for future appearances, "I've pretty much stayed away from television and I don't know that I'll ever really get into it on a serious basis. It looks to me like just too much hard work." Sadly, these words are truer than perhaps even he imagines. I don't know when this interview is conducted, but the month before it appears, in February, Cooper is told by his doctor that the cancer which originated in his prostate and since spread to his lungs and bones is terminal. Less than a month after the issue hits the newsstands, at the Academy Awards presentation, Cooper is too ill to accept an honorary Oscar, which is accepted for him by his friend James Stewart. One month later, on May 13, 1961 - less than two months from the date of this issue - Gary Cooper dies. 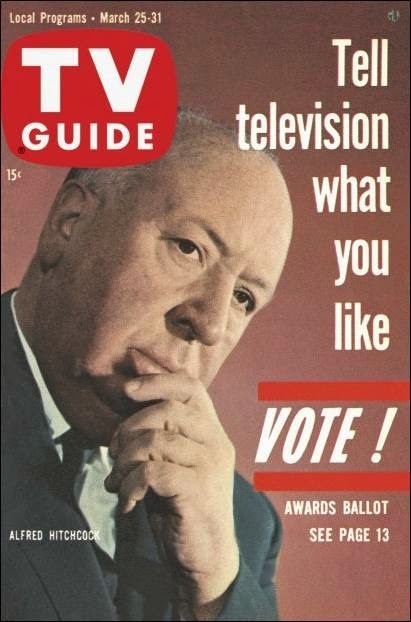 Keeping with the theme of Hollywood and TV, there's Alfred Hitchcock on the cover. Last year, he and the production team behind his NBC series Alfred Hitchcock Presents put out a modest little move called Psycho, which turns out to be Hitch's biggest hit, earning him his last Academy Award nomination for Best Director. How do you follow up something like that? By doing what you do best. After a year of slumping ratings, Hitchcock has returned to his roots, emphasizing "the strange and bizarre kind of murder tale that is Hitch's particular pet." People have gotten used to him being offbeat, he says, and so the answer is to become more offbeat, even macabre. He's filmed episodes written by his Psycho partner Robert Bloch and short-story master John Collier, stories that "might curdle the blood of a werewolf." There's a catch to this kind of success, though, as Hitch points out. "I can't make just any picture I want to. I've got to make a suspense picture. If I don't the audience keeps waiting for the body to be found. Same with television. I've got to have the surprise, the twist ending." Which is, he says gleefully, that the husband can get away with murdering his wife. Until the coda, that is, when Hitchcock generally dispenses some sort of retribution that suggests the killer didn't get away with it after all. Alfred Hitchcock Presents premiered in 1955; it's now in its sixth season. By 1962 the show has expanded to an hour (retitled, appropriately, The Alfred Hitchcock Hour), and will run until 1965, one of the longest-running anthology series in TV history. It's unusual for a network to schedule two documentaries in a single week, let alone two from the same documentary series. But that's what NBC does this week with Project 20. Gary Cooper's "The Real West," wasn't even the first Project 20 of the week - that honor goes to the previous night's "The Story of Will Rogers," narrated by Bob Hope. This one is something of a departure from the series' modus operandi, in that Will Rogers left plenty of film footage of his career, in addition to the still photos that are Project 20's bread and butter. 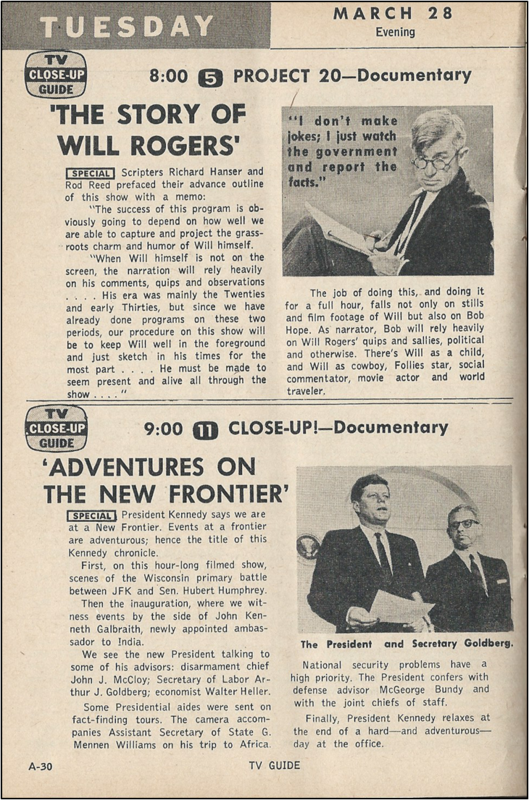 Later that same Tuesday, ABC presents a look at the first two months of the Kennedy Administration in it's Close-Up! episode "Adventures on the New Frontier." It's impossible to miss the optimism of these days; a young, vital administration, manned spaceflight aiming for the moon, new advances in technology, and television itself a growing medium. And, notwithstanding the space program, the majority of these advances were simply designed to make life easier - kitchen appliances, color TV, automotive amenities. There was a feeling that we could do anything. Just take a look at the advertising of the era (and maybe sometime we will) - do we get that excited about much today? And do we have that much confidence? Here's another similarity to last week's edition: Robert Goulet. This week, he's appearing on NBC's Omnibus Sunday afternoon, in a show entitled "An Omnibus of Songs." His costars are Edie Adams and Broadway actor Myron McCormick, and the trio perform all-American music from the Victorian era to today. You say you want more music? Well, over on Channel 11 the pianist Miklos Schwalb is the guest on the half-hour World Artist's Concert Hall. Not to be left out of the mix, CBS has Ted Mack's Original Amateur Hour at 4pm, followed by G-E College Bowl, pitting RPI against Fordham - which at halftime features a discussion of college admission requirements by the presidents of Notre Dame, Bates and Colorado College. College Bowl was only a half-hour show; couldn't have left much time for a significant discussion. See what you miss when you give over the whole weekend to televising sports? ABC's The Untouchables is in the crosshairs again this week, but for once it's not the show's violence that's the focal point. Or not exactly, at least. This time it's the program's portrayal of Italian-Americans. To flash back for a moment: in last week's issue, we learned that "several hundred members of the Italian-American Democratic Organizations of New York" had picketed in from of ABC's New York headquarters, protesting how the series portrayed Italian-Americans. They were led (naturally) by a politician, New York Rep. Alfred E. Samtangelo that "The 21,000,000 Americans of Italian ancestry on whose behalf these pickets parade . . . will not permit ABC-TV to commercialize on crime and to paint America to the world as a nation of violence, shooting and murder" - all committed, one supposes, by Italian-Americans. Samtangelo concluded that this was "our first step toward our objectives in cleaning up the TV industry." This week we find that Liggett & Myers's the biggest sponsor of The Untouchables, has announced it will not renew its sponsorship of the show for next season, along with two other shows - Adventures in Paradise and Asphalt Jungle. L&M denies that this decision has anything to do with a threat from the longshoreman's union to refuse handling any of L&M's products as long as they sponsored the show - it is, they insist, due to ABC moving The Untouchables to a less desirable time slot. Needless to say, "industry executives who have been close to the situation privately pooh-poohed this explanation, alleging that the boycott was the real reason." In other words, we have not one but two flashpoints at play here - not just the ever-popular "violence on television" argument, but the "politically-correct-defamation-of-ethnic-groups" card as well. I suppose one could draw a contemporary parallel if a current show portrayed organized crime as being run by Hispanics, or a show on terrorism in which the bad guys were exclusively Muslims. It's pretty easy to imagine the outcry that would create! And yet it says something about the culture of the times that an ethnic group such as Italians would be outraged by The Untouchables. Ultimately, there's a compromise: Desi Arnez's production company agrees not to create any more Italian-named fictional hoodlums*, to emphasize the Italian-American Nick Rossi in his role as Ness' right-hand man, and to underline the "formidable influence" of Italian-Americans in reducing crime. I dunno, that sounds to me like something between pandering and condescending. Did people really think all Italians were members of the Mafia? I know that things were rough at the turn of the 20th Century, but by 1961? *The Untouchables always had a tenuous hold on the facts, with their stories arousing the ire not only of the aforementioned Italian-Americans, but the FBI as well, who claimed that ABC was crediting Ness' men with accomplishments that should actually have gone to the FBI. But then, Frank Sinatra was upset about this as well - as I recall, he even challenged Desi Arnez to a fight over it. So if the Chairman of the Board takes offense at it, then maybe I shouldn't downplay it. There's also an update here on the ongoing feud between Ed Sullivan and Jack Paar. It all starts with Sullivan's objection to paying out thousands of dollars to entertainers to appear on his show, only to then have them turn up on Paar's Tonight for the minimum of $320. Not, Sullivan stresses, that he has a problem with them talking with Paar; it's the performing part of their visit that bothers him. He goes on to announce that anyone who does his act on Paar for $320 will only get that amount from him as well. Naturally, Paar - who never met an argument he didn't want to get involved in - strikes back. 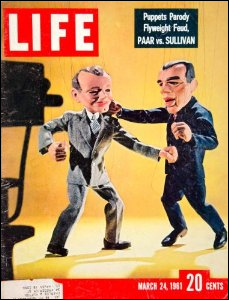 After the comedian Myron Cohen cancels an appearance on his show, Paar announces that he wanted NBC to put him on head-to-head against Sullivan - and we'd see who gets the bigger ratings. The two men then agree to debate the issue on Tonight March 13. Of course, the debate never comes off. Sullivan says Paar "welched out," changing the terms of the debate; Paar counters by calling Sullivan "a liar" on the March 13 show, which gets the biggest ratings in the history of Tonight. Incredibly, each man goes on to claim defeat - Sullivan says Paar outmaneuvered him, that he has no chance in the propaganda war, that Paar was quicker and wittier and had changed the terms of the debate to highlight this. Paar, on the other hand, suggests that he's lost the press fight, but that his viewers appreciate his "brave and courageous" stand. He adds that while the two men could no longer be friends, he'd drop the issue if only a couple of Paar's guests could go on the Sullivan show for the "going rate" (as opposed to the minimum $320). Somehow, I don't think they made anyone forget the Kennedy-Nixon debates. Good reference to Hitch and AHP. Great television. Consistently watchable, with some excellent acting. We're in the midst of Season 7, the last half-hour season; it has some of the best episodes we've seen to date, including the one with Billy Mumy running with a loaded pistol that he thinks is a cap gun. "A Jury of Her Peers" has a stunning performance by Ann Harding in an episode with strong feminist themes. The only downside is having to order these discs from Australia. For some reason, the entire series was released there, while Season 5 was the last season to get a retail release in the US. Season 6 came out on MOD. I lay this squarely at the feet of Universal; they must think the success Warner Brothers Archives is having with MOD is some sort of fluke. Madman Entertainment is who we've ordered from Down Under, as well as the ABC Shop, which is their public television network. If NBC were to do "Project 20: The Old West" today, it would be narrated by a news correspondent, probably Brian Williams. Jack never missed out on a feud! He would have also been in color by this time!